For some time I have been thinking about separating my main website www.davebutcher.co.uk from the technical information in order to improve navigation. I have been actively working on this, with Andy Oakey my web and marketing man from Sheffield, for a few months and have now completed the main part of the project. My new website for all things technical to do with black and white film photography and darkroom processing and printing is now Live! I have had to learn a few new skills to bring this to fruition, most notably how to make and edit videos. Most of these are on the Tutorials page which has a mix of text articles and videos. 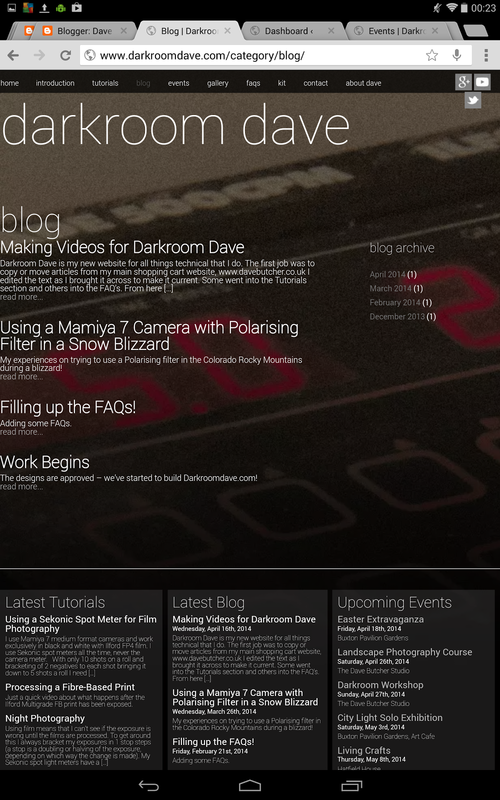 The technical information from my main website www.davebutcher.co.uk has been copied or moved and updated. 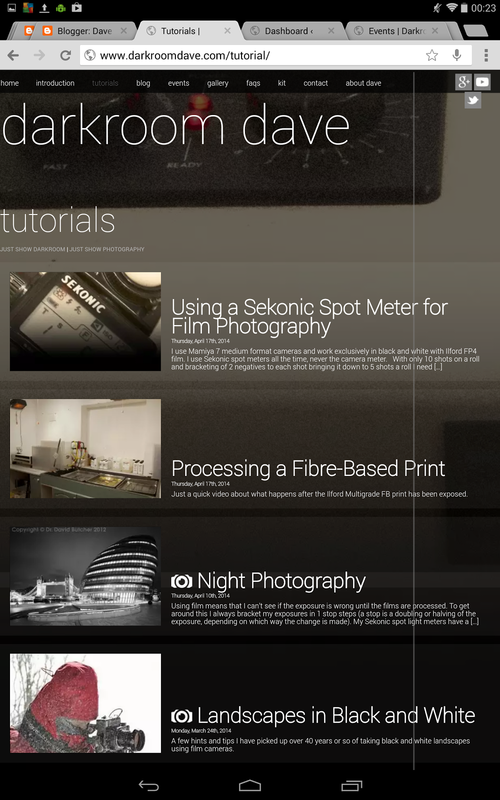 This includes some of the FAQ’s section and there is a new blog specially for photography and darkroom related items. The last blog post was describing the way I do the videos as I had no idea how to do this just 3 weeks ago! www.darkroomdave.com seems to work on mobile phones and tablets but as is usual with new sites I’m sure there will be teething problems. Please let me know if you spot anything using my email mono@davebutcher.co.uk. The screenshots here are all from my Google Nexus 10 tablet. 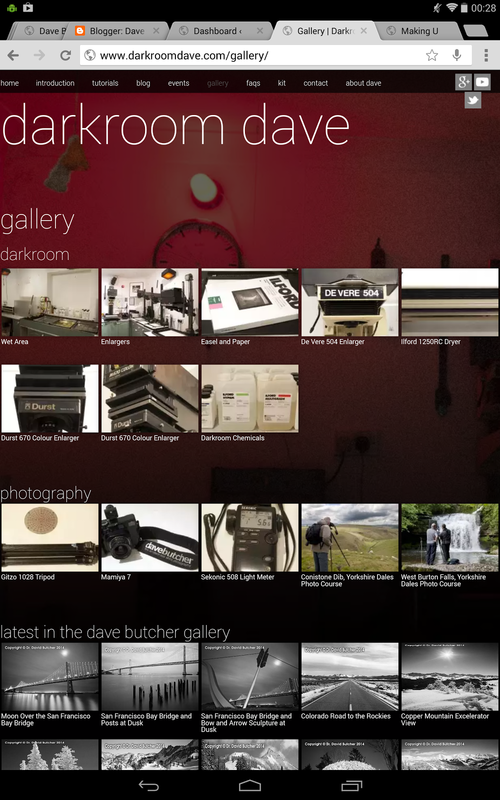 There is also a gallery for darkroom and photography related photos as well as the last 10 photos loaded onto the www.davebutcher.co.uk site. Events are listed more prominently too. There is a button top right to link directly to my new YouTube video channel and another for my Google+ business page which uses +DavebutcherCoUk as the name.